In this paper we discuss the diagnosis, complications and symptoms of hypertension, commonly known as high blood pressure. A major problem of hypertension is the fact that it is asymptomatic until advanced stages. There is a typical symptom of alarm that can serve to stimulate a patient to consult a doctor. Trying to estimate your blood pressure guided by the presence or absence of such symptoms as headache, fatigue, neck pain, eye pain, palpitations, feeling of heaviness in legs is a very common mistake. An individual who does not usually measure their blood pressure simply because they have no symptoms may well be hypertensive, just not knowing about that. On the other hand, if the patient knows that he/she is hypertensive but does not periodically measure the blood pressure, may have a false impression to be controlled. 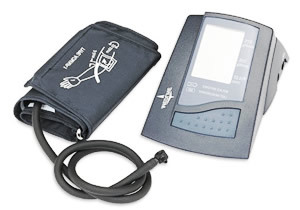 There is no way to evaluate blood pressure without making it through the measurement by specific devices, popularly called "pressure equipment". The fact that some people have headaches or discomfort when they have very high blood pressure does not mean that these symptoms serve as a parameter. These same people may have asymptomatic hypertension peaks and not realize it. It is significant that the pain increases blood pressure and in these cases it is difficult to guess if the pressure rises due to a headache or the headache appears due to high blood pressure. How often should we measure blood pressure? Every adult must at least once in every one or two years measure their blood pressure. If the patient is obese, a smoker, a diabetic or has a family history of hypertension, their pressure should be measured with a higher frequency, about twice a year. Patients who know that they are hypertensive must measure their blood pressure at least once a week to determine whether hypertension is well controlled. Today there are devices for automatic blood pressure measuring, which can be purchased by patients to measure blood pressure at home. A common mistake in the diagnosis of hypertension is to find that the patient is hypertensive based only on a single measurement of blood pressure. A hypertensive patient may have times of day when the pressure is within or near the normal range, as well as a person without hypertension may present occasional elevations of blood pressure, due to such factors as stress and physical exertion. Therefore, you should not diagnose or rule out hypertension, based on only a single measure. Several factors can alter the pressure with time, among them, stress, physical exertion, alcohol consumption, smoking, etc. Many people try to measure their blood pressure after events of emotional stress or headache, situations which themselves can increase blood pressure levels. To make the right diagnosis of hypertension a person should observe three to six high measurements on different days with an interval greater than one month between the first and the last measurement. Thus, to minimize the external confounding factors. That patient is considered hypertensive, who often has his/her high blood pressure and for various periods of the day. When after some measurements of the pressure it remains unclear whether the patient is truly hypertensive or high blood pressure is only due to nervousness caused by measuring blood pressure, the ideal is to request a test called ABPM (Ambulatory Blood Pressure Monitoring). This test is basically a pressure device which is in the patient's arm for 24 hours, checking and recording their blood pressure several times a day, in common everyday situations such as sleeping, eating, working, etc. After 24 hours of measurements, the device is delivered to the physician, who does the interpretation of the records. People with more than 50% of the measurements are considered to have elevated hypertension. Between 20% and 40% of elevated measurements are people with high risk of developing hypertension, which already indicates changes in lifestyle and diet. Normal individual's pressure is controlled by more than 80% of the day. The ABPM can be used not only to make the diagnosis of hypertension in doubtful cases but also to get an idea of the effectiveness of antihypertensive drugs in patients already known to be hypertensive and treatment. If the patient is hypertensive and takes drugs but has high pressures throughout the day, this is a strong indication that the current treatment is not effective. The name to such kind of hypertension was given when we found that patients only had high blood pressure during medical visits. These are people who are anxious in the presence of the physician and the pressure rises punctually. At home, out of the consultations, their blood pressure is within normal ranges. Sometimes it is difficult to differentiate them from true hypertension. In general it is necessary to carry out the MAP to be sure. The white coat hypertension is hypertension itself, but it affects people who are more likely to develop it, being a risk factor for real hypertension. These patients have an indication for changes in lifestyle in order to prevent progression to established disease. Hypertension is rarely curable and the goal of treatment is to prevent organs like heart, eyes, brain and kidneys, called target organs, suffer injuries that cause the diseases described above. As already mentioned, the initial lesions of hypertension are asymptomatic, however, there are tests that can detect them early. An early manifestation of kidney damage by high blood pressure is the presence of protein in the urine, called proteinuria. These proteins can be detected easily through a simple urine test. Small amounts of protein are asymptomatic. Advanced renal lesions lead to large proteinurias, manifested as a large formation of foam in the urine (type collar beer). Another sign of advanced disease is high blood creatinine. High blood pressure, if left untreated, can lead to long-term kidney failure and need for hemodialysis. Hypertension leads to damage of the vessels that irrigate the eyes causing progressive loss of vision. A dilated eye exam can reveal early lesions. The fundus examination is one simple test in which the doctor dilates the pupil and then the eye is observed with a special torch. Compare the two photos below for an examination of the fundus. The first is a normal eye. The second is an eye with advanced hypertensive retinopathy. The red spots are rounded and bleeding bright spots are pus. Note the deformity of the vessels. 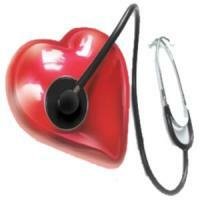 The heart is the organ most probably suffers from hypertension. High blood pressure makes it pump blood with more force to overcome this resistance. 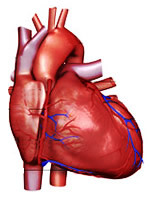 The heart is a muscle and as such hypertrophy (increase muscle mass) when subjected to chronically efforts. A heart with increased muscle mass has a smaller space in its cavity to receive blood. This decrease in the space for the blood within the heart is called diastolic dysfunction. The left ventricular hypertrophy and diastolic dysfunction are the earliest signs of cardiac stress by hypertension. It can be detected on the electrocardiogram, but is more easily seen on echocardiography. Like a rubber band is stretched too long and loses its elasticity, becoming loose, the heart after years of stress related to hypertension hypertrophy stops and begins to dilate, losing the ability to pump blood. This phase is called of heart failure. Hypertension also increases the risk of coronary heart disease, with patients with poorly controlled hypertension at increased risk of myocardial infarction. 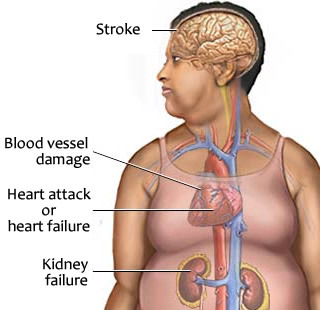 One of the most important risk factors for stroke is high blood pressure. Often infarcts are small and do not cause major neurological consequences. As time passes and hypertension is not controlled, these small lesions will multiply, being responsible for the deaths of thousands of neurons. The patient begins to present a picture of progressive loss of intellectual abilities, which often goes unnoticed by the family in the early stages, but many years later it leads to multi-infarct dementia or vascular dementia. Most often, these major organ injuries caused by poorly controlled hypertension can be reversed if treated in time. But this requires awareness that hypertension should be treated before symptoms of lesions of these organs appear, and not after. The most common manifestations are acute renal failure, retinal hemorrhages, papilloedema of the eye, acute heart failure and encephalopathy (neurological disorders by high pressure). Not all patients with high blood pressure have malignant hypertension. For this to occur we must, in addition to severe hypertension, there are symptoms and acute lesions of important organs. When tension levels are very high, usually above 180 x 120 mmHg, but no symptoms or acute injuries of organs, it is called hypertensive urgency. Malignant hypertension is an indication for hospitalization and rapid reduction of pressure values. In hypertensive urgency, there is no need for hospitalization and pressure can be gradually reduced over 24-48 hours. The pressure reduction with these changes is usually small and a person with very high blood pressure (greater than 160/100 mmHg) hardly ever achieves control without the help of drugs. However, in light hypertensions, there are cases where only weight control, proper diet and regular exercise can control blood pressure. The problem is that most patients will not accept changes in lifestyle and end up having to take medication to control blood pressure. Those patients who come to the doctor with high blood pressure and signs of target organ damage drug treatment should begin as soon as it indicates the fact of long standing hypertension. Obviously, changes in lifestyle are also indicated in this group. Only patients with signs of target organ damage, chronic renal failure, diabetes or heart disease should start drug therapy immediately. I will describe the main drugs that used to control high blood pressure. 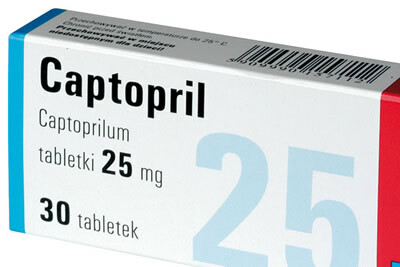 Do not use this text for self-medication, but to be able to discuss with your doctor the drugs most suitable for you. There are numerous drugs used to treat hypertension, but four classes are classified as first-line drugs. Importantly, many patients need more than one medication to control their blood pressure. Some people have hypertension difficult to control and sometimes need up to six anti-hypertensive drugs. Drugs are cheap and with good results. If not the first option should be taken into account than at least the second. This class of diuretics is a great option as it is the first antihypertensive drugs for blacks and the elderly people. Very high doses can interfere with blood sugar control in diabetics. Diuretics increase the uric acid and should be avoided in those with gout. The Lasix (Furosemide) is a diuretic and belongs to another class; it is not indicated as first-line treatment of hypertension, except for patients with heart failure or chronic renal failure. Also excellent drugs to control blood pressure. They are indicated mainly to young people with cardiovascular disease and chronic renal insufficient, especially if they already have proteinuria. Malfunction in blacks. Can raise blood potassium and cause allergies in some cases. Best choice for blacks and very good for seniors. It is a class of antihypertensive agents with strong action and is a good choice when blood pressure does not yield with diuretics or ACE inhibitors. Some people have edema (swelling) in the lower limbs as a side effect. 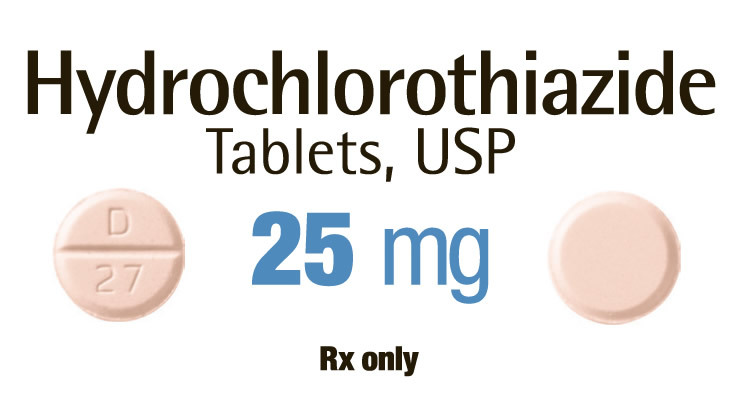 Are lower than the previous three, but should be the first choice for patients with cardiovascular disease, cardiac arrhythmias, migraine, hyperthyroidism and anxious people with hand tremors. Not to be used by asthmatics and people with heart rate below 60 beats per minute. Patients with benign prostatic hyperplasia use a different class called alpha blockers such as Prazosin and doxazosin. Second-line drugs are not to be required in other groups. In severe cases, that are difficult to control, there are alternatives such as hydralazine, methyldopa, clonidine, and minoxidil, more potent drugs, but also a higher incidence of side effects. I suffer with hypertension. My blood pressure may be not very high (140/85), but I cannot sleep at night. I start suffocating. For the last 6-7 years I have been taking Nifedipine and I liked it. But recently my heart has started beating after taking the medicine. Can there be any relation or is it an accident? My mom (age 65) was prescribed a medication called Vasari H. She suffered from an ischemic stroke and then stayed a long time in hospital for treatment of hypertension. Has been taking the drug for 2.5 months, the pressure indicators have stabilized. How long is it allowed to take Vasari H? Hi, I am 22, but I often have a headache, pills do not help, the pain can last for three days, the blood pressure is always low 80 to 40! What should I do? Should I start screening?